Kimberly Peeler-Allen has been working at the intersection of race, gender and politics for almost 20 years. Kimberly is the Co-founder of Higher Heights, a national organization building the political power and leadership of Black women from the voting booth to elected office. 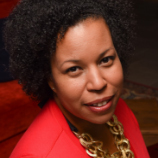 A highly skilled political fundraiser and event planner, Kimberly was the principal of Peeler-Allen Consulting, LLC from 2003 to 2014, the only African American full-time fundraising consulting firm in New York State. After completing the 2002 gubernatorial campaign of H. Carl McCall where she served as the deputy finance director, Kimberly founded her New York City-based consulting firm to help develop capital for clients, organizations, and issues affecting people of color that have historically been kept outside of the mainstream. Kimberly served as finance director for Letitia James' successful bid to become Public Advocate of the City of New York and the first African American woman elected citywide in New York's history. In 2018, Kimberly was selected as one of the Roddenberry Fellowship's 20 incredible established and emerging activists to devote an entire year to projects that will make the U.S. more inclusive and equitable through their inaugural cohort. This important discussion will cover Black women leading at the polls, the importance of Black women in the electorate and where Black women have been running and winning across the country.